Hello my friends! Are you seeing what I'm seeing?? I do believe that what we have here is an actual blog post ABOUT A BOOK. I'm trying to think when the last time that occurred. Let's not stress our brains, but let's just say it's been awhileZ. 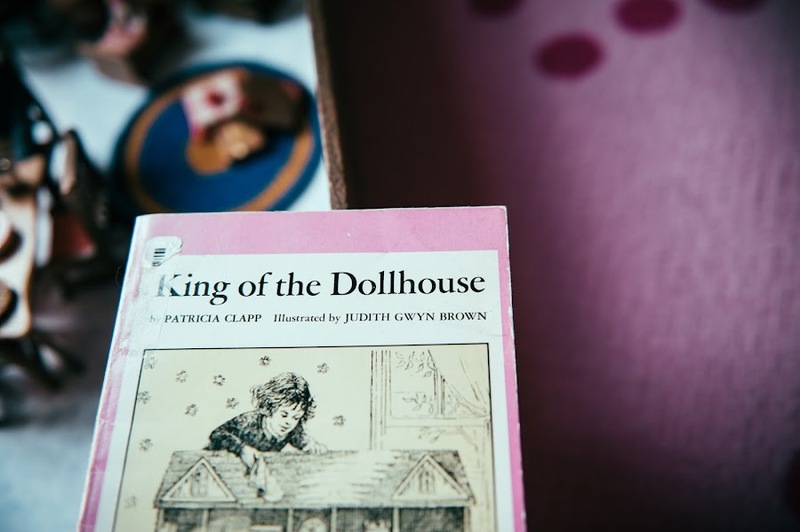 And I hope you love the look of what I'm showing off today - 'King of the Dollhouse' by Patricia Clapp. This vintage charmer came out in 1976! I was six years old. I'm a vintage charmer too! 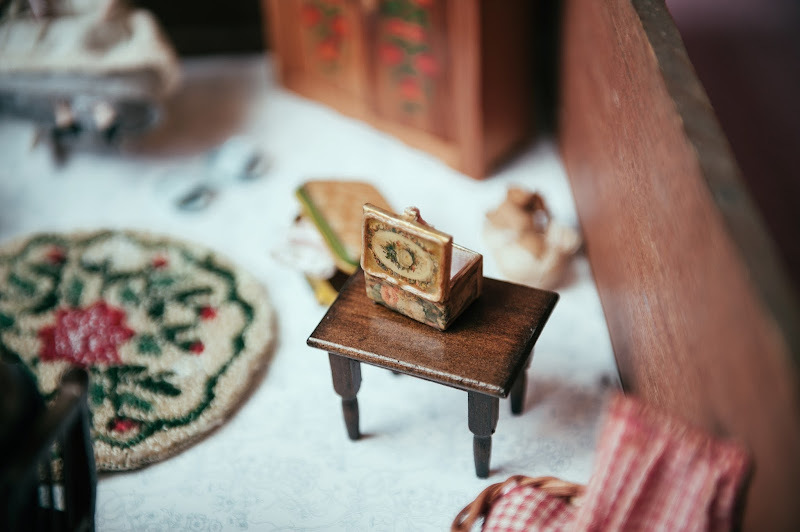 I found out about this sweet story via a lovely blog - Once Upon a Bookshelf, I think it was called?? Curated by the amazing Rebecca. But sadly, her blog is no more and I can't link you to it. But she blogged about this book, and I instantly clicked 'purchase' once I got the gist of the story. 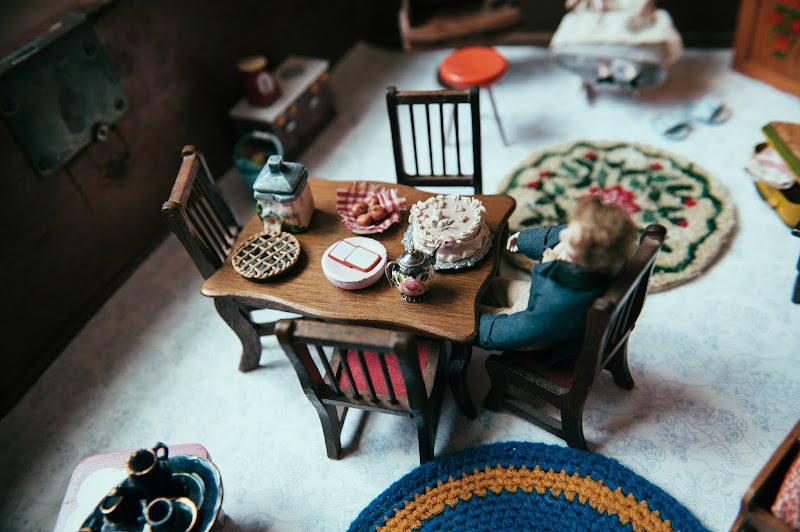 A little girl realizes that a miniature family has moved into her dollhouse. 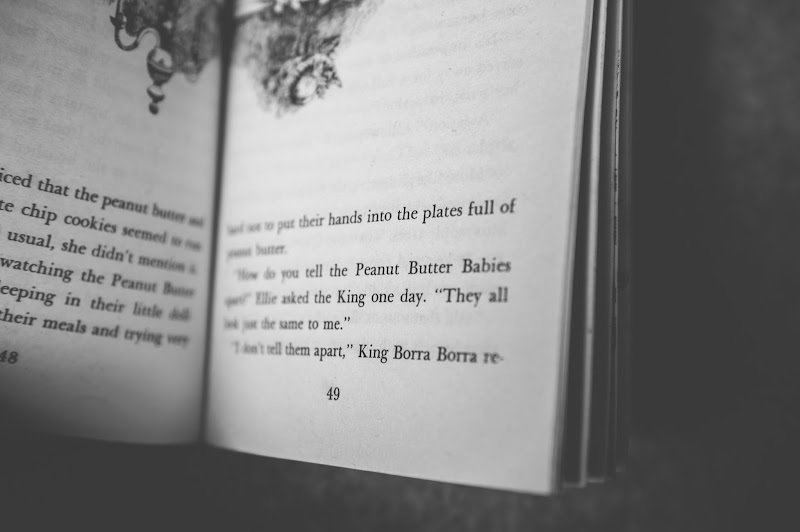 A ROYAL miniature family, with a rather progressive (for the day) plot line - King Borra Borra is a stay-at-home dad to a whole bundle of little babies (I forget how many there are - ten? Twelve? ), while the mama-queen rides horse-mice and has Many Adventures because she has "a restless spirit". Occasionally she floats back home to tell her babies new bed time stories. 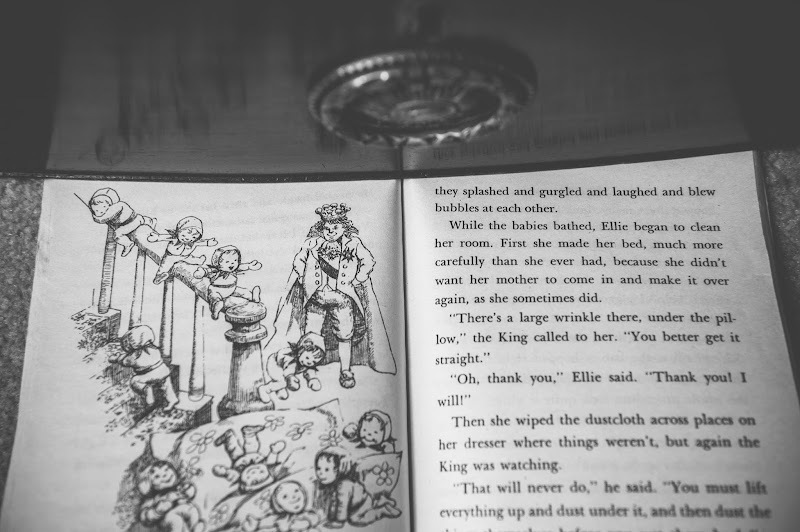 Ellie, the little girl, becomes friends with the little king, despite his Extremely Haughty Attitude, and helps to care for "the peanut butter babies" - so referred to because they have no teeth yet, and peanut butter is their favorite food. When Julia and I read this, (about a year or two ago? I think she was 8.) 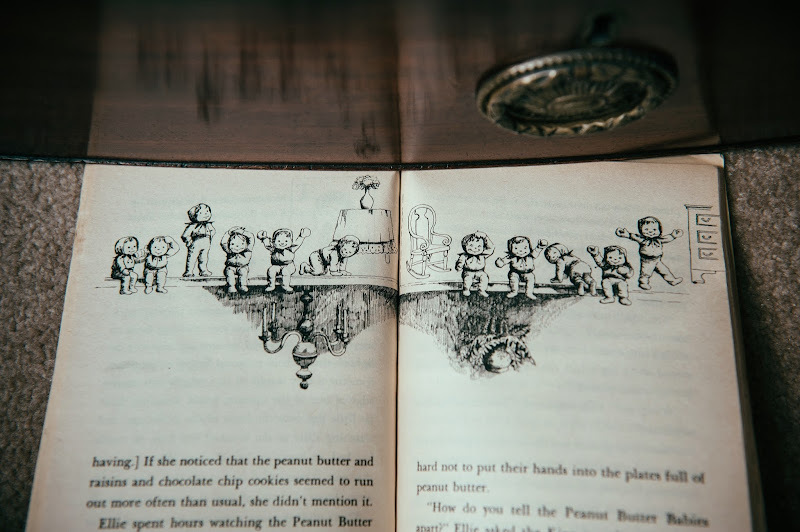 we were so entranced by the adorable peanut butter babies, which are drawn with great whimsy and charm by Judith Gwyn Brown. See the above photo! If you get this book, AND YOU SHOULD, do it for the massively darling Peanut Butter Babies. The details about their daily routine, and the descriptions of their little wee baby life and antics are just the CUTEST. I want a peanut butter baby! One of them is named Marmeduke, we come to find out at the end. Eventually the King and Queen feel that since the babies are growing and beginning to learn to ride their own mice, they need to find a home out in the open fields, and they relocate to a hollow tree that was recently vacated by a nice squirrel family. 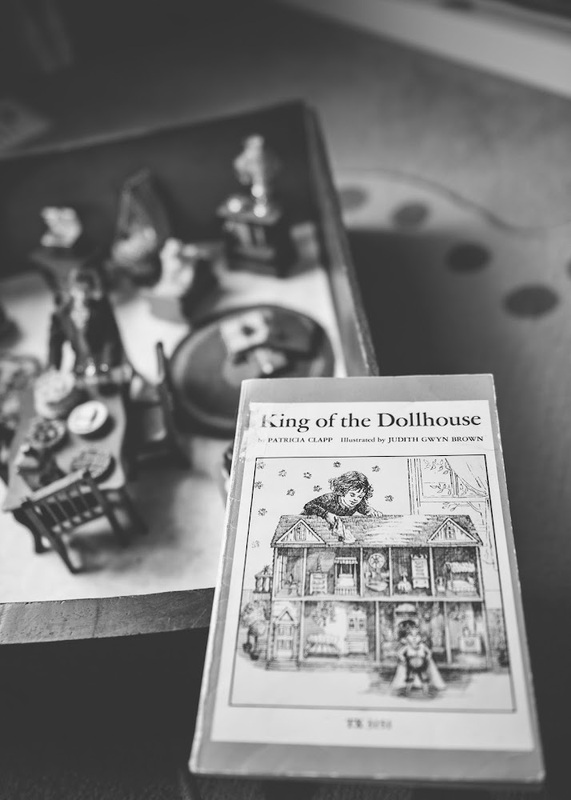 Ellie is sad to lose their companionship, but she contents herself with the tiny fairy crown that the king leaves her, and she decides to write her own little book about the royal family who lived in her dollhouse. The whole book is very slight, only 94 pages, and I think we read it in two or three days. And it has stayed with us. Julia and I still marvel at the extreme darlingness of those peanut butter babies! Earlier in the summer (yes, that's how long it took me to get this post up and written), I told her that I was going to profile this book, and she was so delighted. 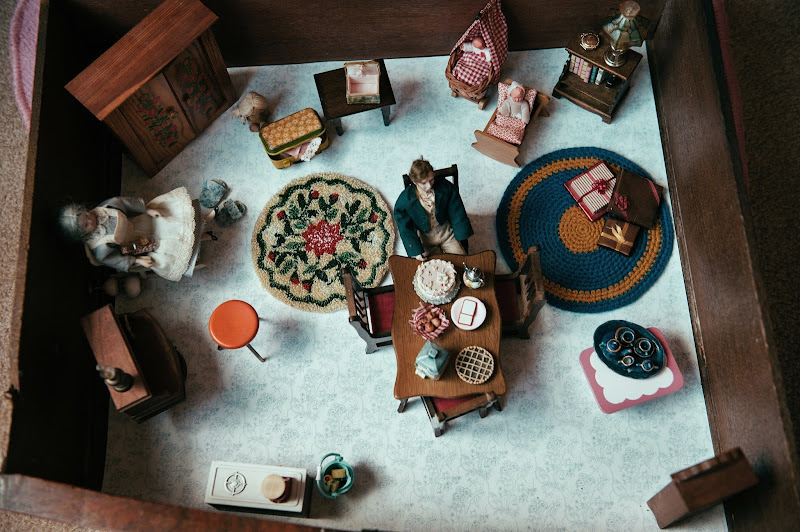 We decided to make a little dollhouse scene in one of my dresser drawers, which has remnants of some realllllllllllly olllllllllld Laura Ashley drawer liner paper. We dumped out all of my socks and pajamas, and took some bit and pieces from our dollhouse to put in the drawer. 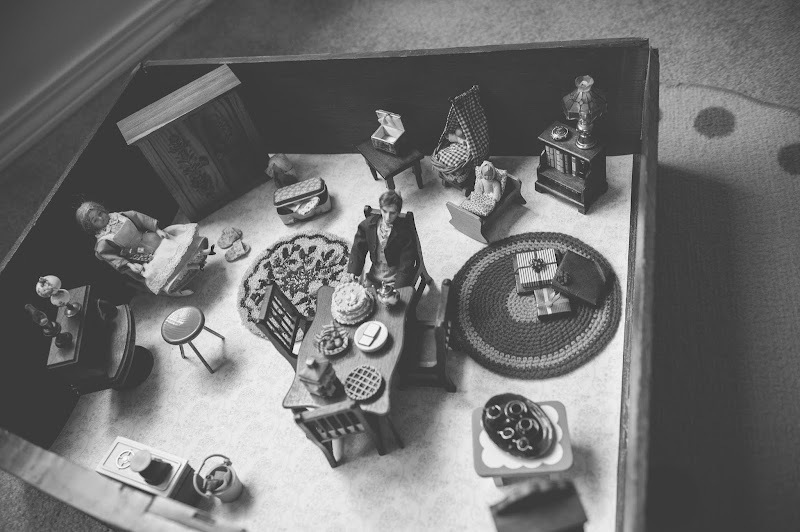 Friends, we LOVED playing with this little scene/set and Julia was sad when I eventually needed my drawer back. 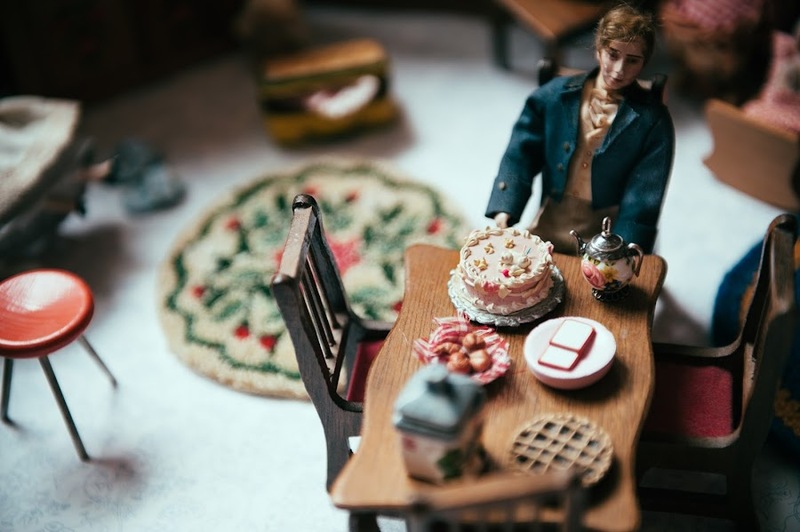 Everything looked so cute in it, better than it does in my dark old dollhouse! The daddy doll is mine from when I was twelve. He came from London and has lost quite a bit of paint from his nose. 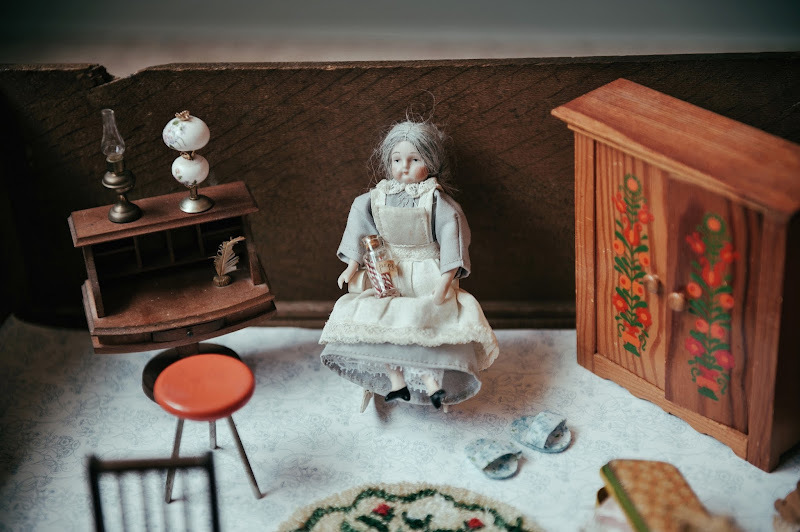 The nanny/grandma doll is also that old, and she is Julia's favorite dollhouse doll and mine too. WE LOVE HER. She's holding some peppermint sticks, not sure if you can see that? And we didn't have too many babies, but we have a couple, and those were our stand-ins for the peanut butter babies. This book is out of print, but I highly suggest you get a used copy. It's one of the sweetest, cutest, most adorable books I've ever come across for kids. 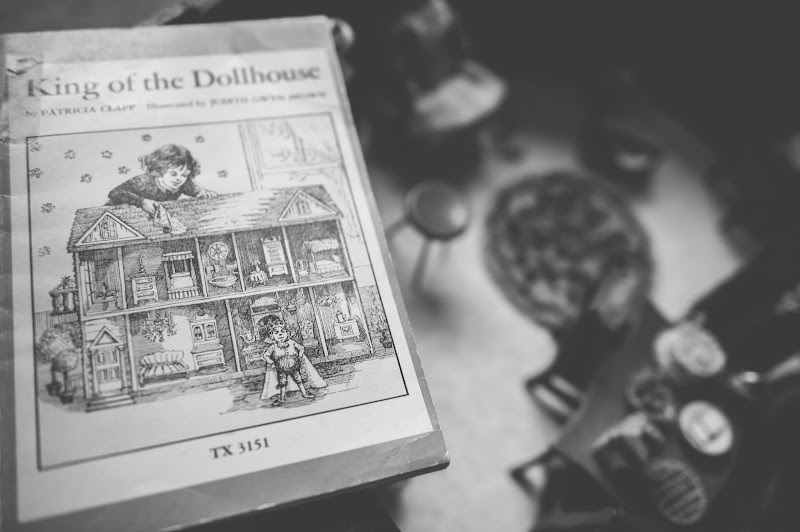 And if you're a dollhouse lover, you just have to find it. There's a full page picture of the babies gleefully jumping into a jar of peanut butter that is so ADORABLE and I'm kicking myself that I didn't snap that page for you. Oh well. Go find this one! Great for ages 5-9. 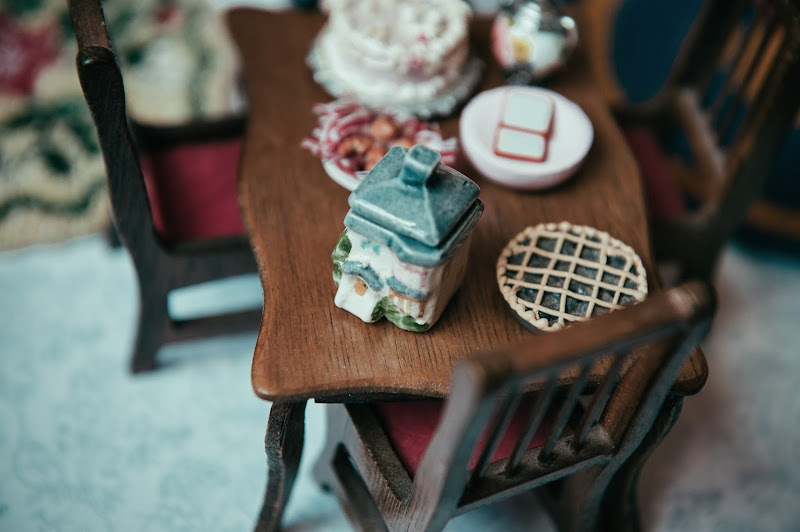 Love the dresser drawer doll house! Isn't it fun? We had a good time with it!! Oh, this looks fantastic. My newest independent reader would just love it (and the shorter length wouldn't be so intimidating!). Thanks for the recommendation. Your "drawer house" looks adorable too. I'm so indebted to Rebecca :) I wish her blog was still going, it was so charming! 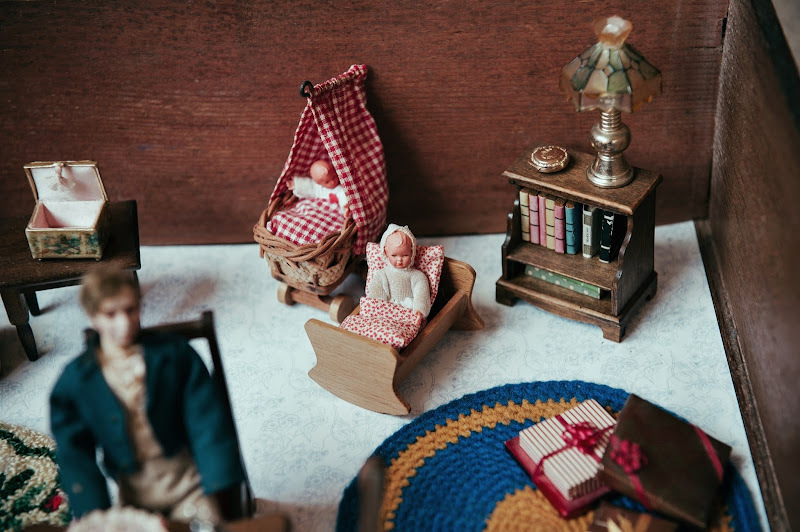 I love it that you saved your childhood dolls.And, doll babies riding mice! I want to read this book. 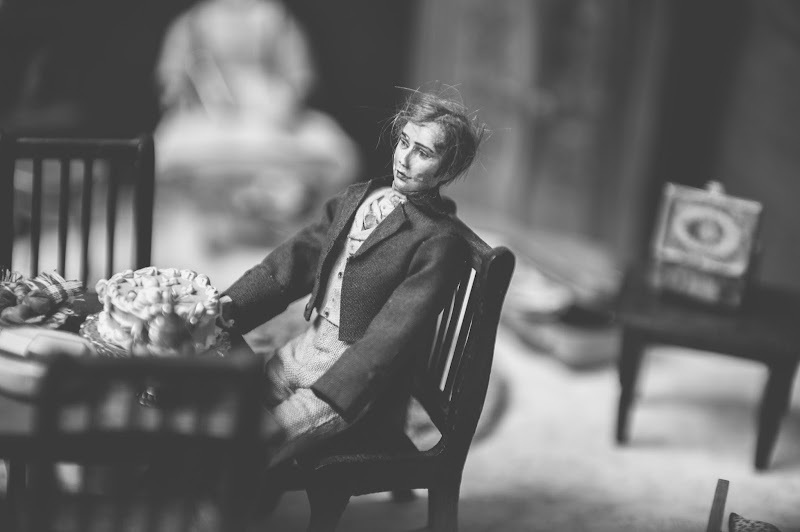 Oh Claire, I had the loveliest family, so old fashioned in old fashioned clothes. If I had two brains in my head I would have cared for them better and preserved them better. The son lost his legs. The mom lost her hand and her dress mildewed. They were kept in boxes in Hawaiian humidity and did not fare well! My FAVORITE of favorites was the little girl - she was the best and then last year our new puppy found her and ate her. Both Julia and I cried! I've never found dolls to replace them! I'm tracking this book down right away. Love this post! 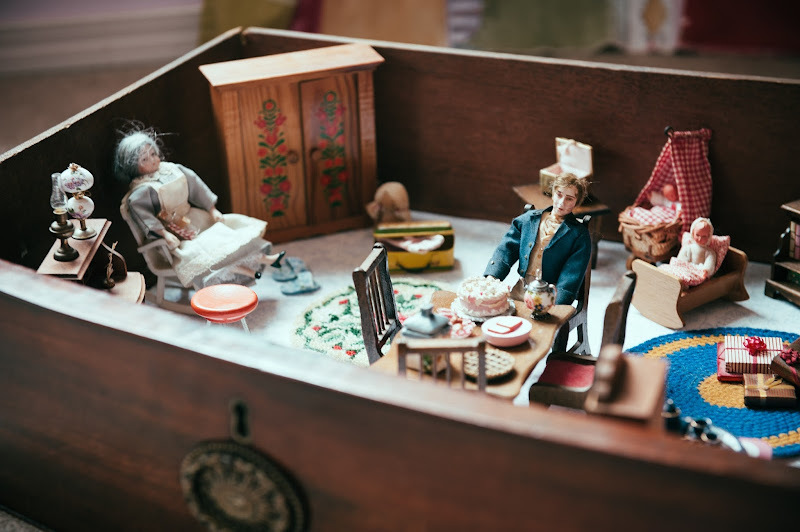 The dolls look so lovely in your drawer! I remember this book, but I still haven't gotten it. I haven't blogged since school started. Poop. So if I hit the back button on my phone after commenting, it posts the comment again. I always try to remind myself that this will happen, then I do it anyway.